Donald Trump as well as Attorney General Jeff Sessions prefer to speak about “political violence” or “despicable acts” instead of “terrorism”, when referring to the bomb mailings presumably sent by Sayoc. New York governor Andrew Cuomo did talk about “terrorism” from the beginning. Sessions left the door open to broaden up the five current charges against Sayoc as the investigations unfold. For now, they include illegal mailing of explosives and threats against former presidents. Regarding the shooting of Robert Bowers in the Tree of Life sinagogue in Pittsburgh which resulted in 11 deaths, the public safety director of the city Wendell Hissrich confirmed in a press conference the massacre “falls under hate crime” (which in Pittsburgh can lead to a death penalty, The New York Times said). The Antidefamation League (ADL) itself -an organization founded to fight antisemitism which now fighst as well against other sorts of hatred- called on authorities “to investigate (the attack) as a hate crime”. Let’s see how he comes to that conclusion, which is not only his at all. Experts from around the world have been trying to get a straight answer to the meaning of “terrorism” for decades and there is still no final consensus. But they agree on basic common characteristics and an essential aspect that differentiates the terrorist attack from what is not. Hoffman recognizes there are many different visions. In his book Inside Terrorism (Ed. Columbia University Press), he devotes up to the first 44 pages to, literally, “defining terrorism”, the very title of the first chapter. A historical review of the phenomenon, which emerged with the anarchist movement at the end of the 19th century, demonstrates the changing meaning of the word and the way it is carried out. But at the same time it confers clarity on characteristics which have remained over time. perpetrated by a “subnational” group or a non-state entity. fear or emphasis on terror (51%). Other concepts, such as “threat” or “psychological effects” only appeared in less than half of those definitions, although these two were those which followed in frequency to the ones previously mentioned. So the concept “political violence” used by Trump and Sessions to refer to the frustrated attacks of Sayoc would directly fit into the common charasteristics of what terrorism is, according to more than 100 definitions. Also the explosive devices were not a hoax, as the FBI director Chris Wray confirmed. The three most mentioned concepts in more than 100 definitions of “terrorism” are: “violence”, “political” and “fear”. So the concept “political violence” used by Trump and Sessions to refer to the mail bombs of Sayoc would directly fit into it. Lieutenant-Colonel Manuel González Fernández, analyst professor of geopolitics and the so-called “jihadist” terrorism at the Spanish Gutiérrez Mellado Institute, argues that a terrorist is someone who carries out “acts of indiscriminate violence to modify or change political wills, organizations or societies.” In his opinion it is a concept that is based more on the aims than the actions themselves: “If by attacking a mosque you get people to fear going to the mosque or you provoke the need of a stronger police deployment, you are a terrorist,” he explains in his classes. González Fernández offers another note that helps understand how terrorists act: “We see a squared chessboard with limitations, while they see a clear board. They can appear on any square of the board.” Thus, he agrees with Hoffman, who also points out the absence of the rules of war in his book, because a conventional war must be produced respecting aspects such as: not killing civilians, respecting countries and neutral actors, not taking enemy hostages, giving a correct treatment to war prisoners… Rules which, by the way, are similarly defined in the Q’ran. Georgetown professor Hoffman admits that also in the conventional wars these rules are sometimes breached, but he indicates that those cases qualify as a “war crime”. In the case of terrorists, they violate these basic rules systematically. 6. thus, facilitate the achievement of their demands”. What about ‘lone wolves’ or ‘lone actors’? For Calduch, the so-called “lone wolves” commit acts of terror, but they are “fanatics who act at their own risk” and do not consider them terrorists, because he attributes to the latter a strategy, with “planning, tactics and logistics”. The differentiation between “wolf” (non-terrorist act) and “lone actor” (in a terrorist context) extends among researchers: Hoffman’s definition of terrorism includes precisely the lone actors and avoids the concept of “wolf”. Lieutenant González Fernández reminds that Osama bin Laden already incited to the solitary action in 1993. This military professor also redefines the attackers usually called “lone wolves” in the media to “coyotes”. From his point of view, a “coyote” is an actor who is part of an operative cell, because they do not self-finance, they do not use means autonomously, they do not radicalize themselves, but rather with books and the internet. The researchers on global terrorism of the Elcano Royal Institute, Fernando Reinares and Carola García-Calvo, also prefer to talk about lone actors for similar reasons. What stays clear after comparing the analyses of all these terrorism experts is that for a violent attack to be described as a “terrorist attack” there must be a political or ideological motivation behind it. So not any massive attack against civilians by a group or a person can be described as a terrorist act, even if Daesh (ISIS name in Arabic) assures that it was carried out in its name. This was the case in Las Vegas attack on October 1st 2017, where the FBI dismissed the vindication of this terrorist organization. Although it is known that its author, Stephen Paddock, planned the attack, the absence of his motivations prevents his classification as a terrorist. As for the investigation on the van strike in Toronto carried out by Alek Minassian on April 23rd 2018, authorities spoke about it as an “incident” at that time. The suspect killed ten people and injured another 13 in what appeared to be a “deliberate” act, according to Toronto Police, but no political or ideological motivations seemed to be behind this tragedy. Therefore, he was charged with counts of murder and attempted murder, not terrorism. 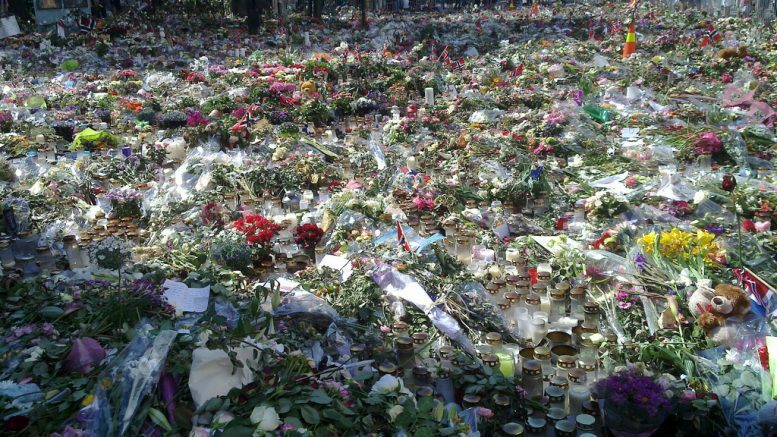 Terrorist attacks were committed by Anders Breivik in Norway -who with neo-Nazi ideology killed 77 people (mostly young people of the Norwegian Socialist Party) in July 2011- or Ali David Sonboly in Munich in 2016, also with neo-Nazi ideology. Those were terrorist attacks just as the ones perpetrated by followers of ISIS terrorist group. “All the attacks that have taken place lately (in the West) have had two types of reaction: if the author was from a European (non-Muslim) family, a reason for mental illness has been sought, or a rare situation… But name a Muslim as a possible author of an attack, then there is no need to explain more,” professor Emeritus of Arab and Islamic Studies at the University of Barcelona, ​​Dolors Bramon, complains. This happened in the case of Breivik (the court which tried him, assessed the possibility of a mental illnessand but ended up dismissing it and he has to serve a prison sentence) and in Sonboly (killed in the attack). For Bramon, this is a sign of the Islamophobia implicit in the West societies which appears after each new attack and she asks to avoid it. * This article was first published in Decembre 2017. It has been updated on Octobre 29th of 2018.